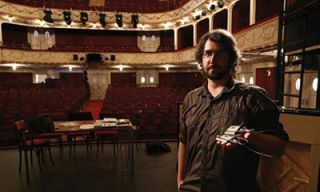 Andreas Ivancsics, head of the sound department at Bühne Baden in Baden bei Wien, Austria, with some of the theater’s Lectrosonics SMDb body pack transmitters. What do the suits in the executive boardrooms and the amateur players in a church performance have in common with the entertainment pros? Plenty, even if they’ll never realize it. As more corporate boardrooms and houses of worship (HOW) are designed with a theatrical bent, there’s much that the integration world can learn about microphone placement, handling, and setup from theater, cinema, and TV professionals. It’s no secret that specialized entertainment and performing arts applications have influenced wireless mic product development for the commercial sound market. Transmitters, for example, have become much smaller, largely driven by theatrical and film/video production. And belt pack units are not much larger than a cigarette lighter. Due to significantly increased consumption of spectrum by consumer devices, wireless microphone products have had to become more spectrally efficient in order to get more channels on air in extremely crowded wireless environments such as Broadway. Another major product feature that has become more of a priority is a reliable rechargeable battery solution. Traditional, off-the-shelf rechargeable offerings are simply not up to the task when it comes to critical applications, Vaveris stated. Increased spectral efficiency, improved form factor, and rechargeable battery technology have all made their way into many of the current product offerings in the commercial market. “The combination of these factors has really allowed Shure to develop products that integrate well into the marketplace for theaters and live entertainment venues, corporate boardrooms, and houses of worship, all while proving high-quality audio,” Vaveris said. For integrators working on systems for theatrical-style presentations, particularly in HOWs, it’s not just the curtain, but the bar that is being raised. More and more technology, including video screens and projection, LED lighting, theatrical set designs, and wireless microphones/ wireless communications systems are being integrated into this environment, increasing the challenge, said Lectrosonics’ Karl Winkler. Antenna cable run lengths need to be considered. Often, the receiver rack is positioned on one side of the stage, so one antenna run can be short while the other one will be much longer. For period costumes, the sight of technology can ruin the suspension of disbelief. Hiding the transmitters is important, but at the same time, the materials used to cover the transmitter must be considered.